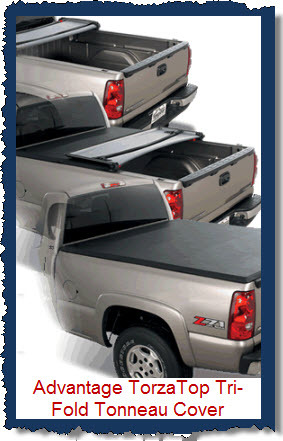 Advantage Tonneau Covers come in several soft tonneau cover styles. Advantage Tonneau Covers gives you three choices to make in your tonno decision process. Do you want a soft folding tonneau cover, a solid folding tonneau cover or a snap-on soft vinyl cover. Lots of decisions! So let's read on for more info. Tip: use universal absorbent mats to reduce moisture from spills and mud that cause the growth of mold and mildew in your truck cab and the truck bed area. These mats are easy to clean and help to reduce odors caused by the mold/mildew. Here’s some info on each to assist you in the decision making process. Oh, by the way, all the parts for the Advantage Tonneau Covers are made in the USA and can be customized to accommodate most tool boxes, fuel tanks, headache racks or other truck bed accessories you may have. Advantage assembles all these "Made in the USA" parts at their Ann Arbor, Michigan plant and provides you with a fully assembled tonneau cover, ready to put on your pickup in under a couple of minutes. All the parts are sewn into the fabric and fold up or unfold as a single piece - so you can't lose anything! Advantage makes a tonneau cover for most domestic and foreign pickup trucks made between 1967 and today. In 2011, Advantage Truck Accessories became a member of the THI Corp family. Manufacturer : Advantage Truck Accessories, Inc.
Cover Weight : Approx 50 lbs.